For three hours on Monday, March 3, Israel’s Prime Minister Binyamin Netanyahu met in the Oval Office with U.S. President Barack Obama. Obama has been carrying the torch for the so-called “Two State Solution,” which he inherited from his predecessors. He made it clear, as he has repeatedly in the past, that he wants Netanyahu to get with the program. Caroline Glick, the journalist and deputy managing editor of The Jerusalem Post has articulated precisely that. And right on cue, too. Glick’s book, “The Israeli Solution: A One-State Plan for Peace in the Middle East” (Crown Forum 2014) was released on Tuesday, March 4, and this Jewish Press reporter sat down with her that afternoon in a mid-town delicatessen in New York City, to talk about the book. They believe that because it is the only thing they hear from their leadership. “But after twenty years of abject failure, of nothing but death and destruction in the wake of the Two State effort, surely it is time to begin a discussion about alternatives. My book is meant to be the starting point for that discussion,” Glick said. Glick’s credentials for writing such a book are comprehensive. From 1994 – 1996, at the height of the “peace negotiations,” she was a core member of Israel’s negotiating team, and she was personally involved in the negotiation of a half-dozen major agreements with the PLO. In 1996, when she completed her IDF service, Glick became Prime Minister Binyamin Netanyahu’s assistant foreign policy adviser. By the time the Palestinian Arabs had officially stopped pretending to be a part of a peace process and instead were fully engaged in their bloody and extended terror campaign, Glick was a columnist and editor for major Israeli papers, including the Jerusalem Post. Glick’s book is divided into three parts. The first part deals with a detailed history of the failed attempts to create two states in the tiny area between the Mediterranean Sea and the Jordan River. Although most careful observers of the Middle East will flatter themselves that they know this history well, it is doubtful that anyone has had a more up-close and personal opportunity to observe, analyze and record this history than Glick. The second part of the book lays out what she believes is the best option for moving forward for all citizens living in the area currently known as Israel and the disputed territories (also known as Judea and Samaria or the West Bank). Glick’s plan is liberal, democratic, and it provides the best chance of a good life for the greatest number of people who live in the area, whether Jewish, Muslim or Christian. The third part of the book addresses the likely responses to the One State of Israel plan. She articulates and addresses the anticipated responses by Palestinian Arabs (both terrorism and diplomatic threats), by others in the region (Egypt, Syria, Lebanon, Jordan), by the European community, and by the United States. The harshest response, Glick anticipates, will come not from the Palestinian Arabs, but from the European community. The answers she offers are not sugar-coated. They are realistic and well worth the consideration. For years, outsiders have cajoled, prodded, threatened and demanded that Israel do what may well constitute an act of national suicide, but Israel has not even been permitted the opportunity to try it because of the intransigence of the Palestinian Arabs. Isn’t it about time Israel takes the opportunity to try an alternative which, while also a great risk, is one that brings with it the one chance for Israel to recognize and dignify its own rights and history? THE PLAN Glick’s option is a one-state plan. It is one in which the so-called Green Line, the 1949 Armistice Line, is dissolved, and the laws of Israel extend throughout Judea and Samaria. Arabs living in those areas would immediately become permanent residents of Israel, with the option of applying for Israeli citizenship. They would have the right to live wherever they choose, work wherever they choose, and they would have the right to elect their local governments. The Israeli military government currently operating in the territories would be dissolved, as would the Palestinian Authority and its security forces. Eligibility for citizenship would be decided by a government ministry, with certain eligibility standards such as membership in terrorist groups or history of incitement as disqualifiers. But even those for whom citizenship will not be extended can remain as permanent residents. The biggest obstacle pro-Israel Jews will need to overcome in order to rationally consider and evaluate Glick’s alternative is the reflexive fear of Israel “being overrun with Arabs” unless there is a separate state of Palestine. That is the bogeyman ironically presented, either overtly or subtly, by the liberal Jewish mainstream and their leadership. In second place, but only by a little, is the perception that Israel cannot remain a democratic country if the Palestinian Arabs become Israeli Arabs. These two shibboleths, demography and democracy, are raised like twin swords of Damocles: sure you’ll get a complete state, but the Arab “womb bomb” and the toxic effect of racism will combine to ensure there will be no Jewish State at all. Glick is here to tell you, “’tain’t so.” You’ll have to read her book to see how she deals with these, and all the other, potential problems with the paradigm she presents. But that’s good, because you should. She addresses all the issues you or your friends will raise. And if there are certain issues the book doesn’t satisfactorily answer it nonetheless achieves Glick’s goal: to start the discussion for pro-Israel Americans of an alternative to the conclusively failed non-solution of two states. 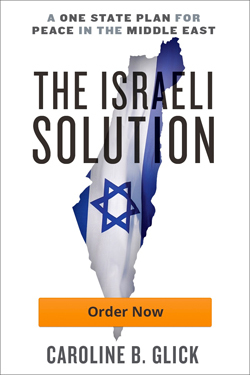 “The Israeli Solution” reads like a hard-hitting legal brief: she marshals the relevant facts but presents them clearly, she straightforwardly addresses the counterarguments, then disposes of them decisively. Yet at the same time, Glick’s book is a great read because she weaves statistics, history and facts – including her own view from her own seat at some very important tables – into a compelling narrative that is powerfully persuasive. By unabashedly calling for the One State of Israel, Glick has turned the tables on many of Israel’s enemies – and even some of its friends – who believe Israel is doomed to an apocalyptic future unless it embraces the tired, failed, two state option. She is willing to take that challenge because, as she shows in this essential book, her facts and her judgments are the right ones. Along the way, Glick strips away the Israel-bashing argument that the Jews are oppressing their Arab neighbors — because Glick shows that Israel can, and should, enfranchise the very people who so many Israel-haters claim to care so much about. Glick is simply unafraid — of her Arab neighbors; of the world’s hostility to the Jewish state; or, so far as this reporter can tell, of anything else.